I have run a grand total of ONE time since crossing the finish line of the Chicago Marathon in October of last year. I know, I know, I'm disgusted with me too. So when I got Fleet Feet's notice about the Pi Day "Pi K" Fun Run this coming Monday evening (3.14 - PI DAY, get it?) it seemed like a pretty solid way to get back out on the running trail without getting myself up super early or registering for a timed race where I would embarrass myself. Also, my wife and I ran this race back in 2014 and had a great time. Plus, after an article I wrote for the Tribune about xkcd creator and all-around baller Randall Munroe speaking in Chicago at an Illinois Science Council (ISC) event, I know a little more about the organization behind the Pi Day Pi K and their mission. Founded in 2006 by nonscientist Monica Metzler (who also serves as executive director), the ISC was created to help engage adults in science and technology "with a fun, nonstuffy approach." ...Metzler, who has a law degree and two degrees in public policy, was quick to point out what the ISC is not, before discussing what it is: "We're not scientists talking to scientists," she says. "We are about raising awareness, understanding and appreciation of science among the lay public. It's about people like me who aren't in the science field but are interested in this." So I registered for the race and got on the phone with ISC executive director Monica Metzler again today to find out a little more about the Pi Day Pi K.
Why did you create the Pi Day 5K? ISC is all about doing public outreach in science, technology, engineering and math. And math is kind of hard to bring to the general public in an accessible way. But pi has always just been fun. I think most people remember it from high school geometry and so the idea came up, “Well if a 5K is 3.1 miles, PiK is 3.14 miles” and so it was just a fun way to imagine getting people to think about math one day a year if they’re not using it on a regular basis. We've been doing a promotion for Pi Day since 2009. What we do every year is reach out to bakeries and restaurants throughout town and encourage them to offer pie specials on Pi Day and then we promote that out to the media and the public. So in 2012 I had the idea to do the Pi Day run. And how did you get Fleet Feet involved? When I had the idea I talked to some runners and it seems like the thing about fun runs is that everything has to have a hook, a clever angle to it. And so we thought we’d make it kind of fun - give people pie afterwards, make it 3.14 miles… I think Fleet Feet was probably skeptical at first, understandably so, because my assumption is that Fleet Feet probably gets pitched on a daily or weekly basis. I went to them because I know that they are one of the best run managers in town. What we did the first year was just a test. We limited the entries to 314 people in one store - we thought we would just throw it out there and see what happened - and lo and behold we sold out in three weeks! Side note, in that first year it sold out, I’m not kidding, in 3.14 weeks! Who did the math on that? We went live with it on February 1st and we sold out on February 22nd. And 22 days is 3.14 weeks. Seriously, this will never happen again in the history of the universe. But it was fun, everybody had a great time at the post party, and since then Fleet Feet has expanded it so that this year it's at four locations (Lincoln Square, Old Town, South Loop and Elmhurst). What makes this race unique among races? Well, I think it’s a couple things. Instead of 3.1 miles it’s 3.14. It’s not a significant length difference, but we do make it very fun. It’s family friendly. It’s a run/walk or, as we say, skip/amble/strut/stroll. 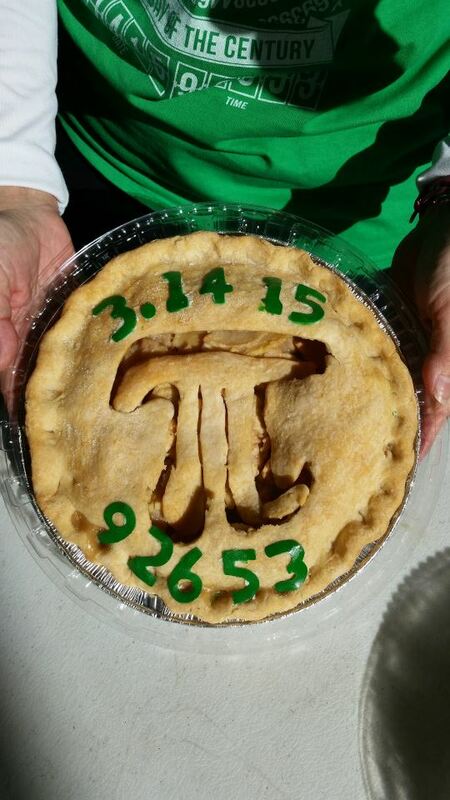 And because it’s Pi Day we always have a party afterwards with pie. This year we’ll have pizza and beer as well. And we always have a trivia quiz with prizes. And that is much more of a party beyond just the run itself. It's an excuse to kind of be social. It’s just kind of a fun, somewhat silly way to think about math and how critical it is to everything around us. Math for a lot of people seems too esoteric or too distant or something they kind of vaguely remember from high school. So, yes it’s fun and we eat pie, but technically knowing what pi is - allowing that measurement, that mathematical constant in calculating the area of a circle, is critical to all sorts of things. You can’t do infrastructure and build bridges and a million other things. You can’t do architecture or construction if you don’t know math. And you certainly can’t do baking and cooking without it! So math really is critical to our everyday lives. And this is just a fun excuse to celebrate it by eating delicious desserts. I am never able to do the run myself because I’m running around grading trivia quizzes and stuff like that. This has been my inherent problem with ISC all along - I started this because I enjoy learning stuff and hearing speakers. And now running the events I don’t get to just sit and listen and pay attention. I’d have to quit the organization and let somebody else do it so I could just sit and enjoy it. Anything else you’d want people to know about the race? It starts at 2Pi (6:28PM). And sometimes people kinda go, “It’s not a PiK, that would be 3.14 kilometers.” And I go, “Okay you’re being a little pedantic." It just doesn’t work to say Pi Day Pi Miles! And K can mean a lot of things. In law K is actually short for a contractual agreement. 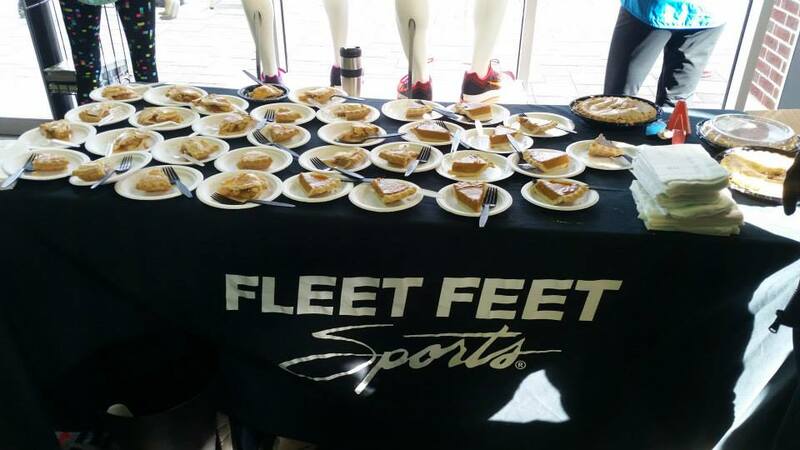 So I would argue that a PiK is that you’re making a contractual agreement with us that if you run 3.14 miles then you get pie!